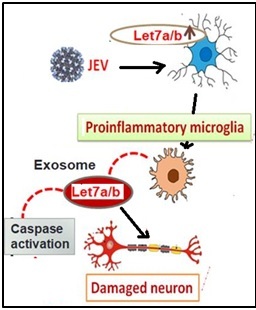 Japanese Encephalitis Virus-induced let-7a/b interacted with the NOTCH-TLR7 pathway in microglia and facilitated neuronal death via caspase activation. In this study, we have shown that microRNAs (miRNAs) released from the activated microglia upon Japanese Encephalitis virus (JEV) infection may exacerbate CNS damage. We have provided evidence that let-7a and let-7b (let-7a/b secrete through the vesicles from microglial cells in response to JEV infection and induces caspase activation in the primary cortical neurons that are a major target for JEV infection and pathogenesis in vivo. Our results suggest a new dimension of extracellular vesicle-mediated events that may cause neuronal damage and link to JEV pathogenesis.